Cheshire Artificial Grass supplies and installs some of the highest quality artificial grass from their South Manchester base. Artificial grass has become more and more popular in the UK with many houseproud families switching to the neater and more manageable surface. 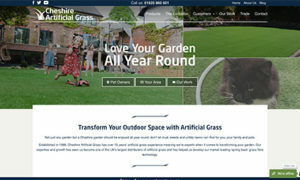 Set up in 1998, Cheshire Artificial Grass cornered a good section of the market with their premium artificial turf. But as more companies entered the market they found it harder to compete and grow. The company commissioned The Artlab to create a new website and help them win new business online. Targeted local SEO and content marketing work led to a sharp increase in traffic for the company, which is busier than ever before. I was very pleasantly surprised by how quickly Rick and his team took in our ideas, created campaigns and delivered results in generation of quality leads. As my business is quite seasonal I am very excited about the prospects for 2015 and continuing to work with Artlab. A full-service approach to marketing helped Cheshire Artificial Grass stay busy right the way through the Spring and Summer and well into the off-season as well. Technical SEO tasks designed to optimise pages to appear in search engines lead to a sharp initial increase in traffic to the website. Regular blogging and other content writing work has been rewarded by Google in several recent mini algorithm updates. This has resulted in more traffic to the website. Because the company is an installer working across Cheshire and South Manchester we optimised the website to perform in key target areas. In addition to organic website visitors, The Artlab also attracted paid search traffic during the company's busy season using Google Ads. The graph (left) taken from the Moz SEO tool shows a sharp and sustained increase in website traffic following a long series of ‘mini-updates’ to Googles algorithm in 2016. The company ranked among the top spots for more and more keywords and search terms as the year went on. This led to an upturn in website traffic just in time for the company’s busy season.